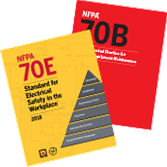 Better improve Electrical Safety and help avoid Costly Equipment Failures with the Updated Editions of NFPA 70B and NFPA 70E. Save on the Set. Use the latest safe work practices and equipment maintenance to help prevent electrical accidents and keep systems up and running. Get the tools that help you ensure an injury-free and productive worksite with this must-have set from NFPA featuring updated editions of NFPA 70B, Recommended Practice for Electrical Equipment Maintenance, and NFPA 70E®, Standard for Electrical Safety in the Workplace®. Optimize worker safety, satisfy OSHA, and help prevent unplanned shutdowns. Cover all the bases with the NFPA 70B and NFPA 70E Set.